Why use NOVOGLAN instead of the steel calliper devices? NOVOGLAN is a Class 1A Medical Device and uses the patented balloon based stretching which delivers the right amount of pressure across the foreskin and avoids focusing pressure on single points. Peer reviewed Scientific Journals have repeatedly reported that to get optimal foreskin stretching you must avoid anything that causes inflammation. Inflammation is the enemy of skin stretching. Pain, too harsh a stretching process or instrument, and tearing or cutting will trigger inflammation. Inflammation makes skin cells less receptive to stretching and often causes further tightening. Balloon based stretching is gentle and allows the user to apply the correct amount of pressure evenly across the skin without inducing pain, cutting or tearing the foreskin. Steel forcep like devices with two or three tips have been around since the 1870s and were found to make the foreskin more at risk of tightening due to too much pressure focused on a few points, instead of evenly across the surface. This leads to micro tears, inflammation, and often pain and almost certainly interferes with stretching. The steel forceps cannot be used on pin-hole phimosis as they wont work if the hole has a diameter of less than 6mm, usually. 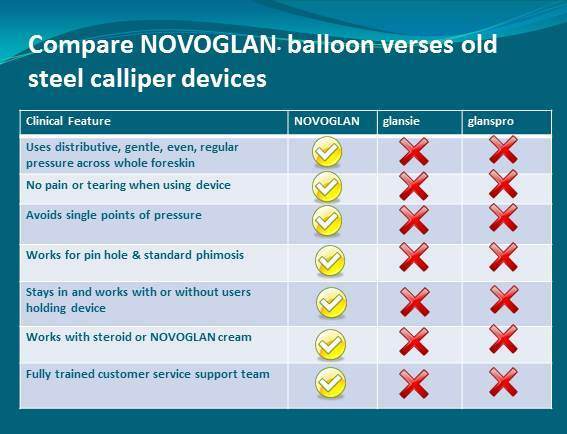 Whereas the NOVOGLAN balloon will work with only a pin hole diameter of 1.5mm or more. Rings may look soft and smooth, however, they have mircoscopic sharp edges that can cause micro tears and cuts which can make your phimosis more severe or worsten. Novoglan balloon is smooth at all times and has been specifically designed to treat phimosis. Steel Retractor stretching is not approved for use in phimosis due to the risks associated with using the device. However, NOVOGLAN Balloon stretching has a GMDN Certification and the ARTG number is 168962. Novoglan has been designed for use in phimosis or for men who choose to preferentially loosen their foreskin. So when you’re thinking about a process to stretch your foreskin you need to avoid anything, too fast, harsh, or likely to cut or tear and cause inflammation. You need to choose a system that is gentle, even, promotes stretching, and will not cut or tear your foreskin. NOVOGLAN has been independently evaluated and Platigo Solutions operates according to Australia's strict Consumer Regulations. Don’t risk inflaming your foreskin with steel tipped retractors. Try the NOVOGLAN Complete Foreskin Care Kit with the our 365 Day Money Back Guarantee.